Darlex Insecticide is the first darkling beetle product formulated for the poultry industry that contains Clothianidin – a second generation neonicotinoid proven to provide lasting control of darkling and hide beetles. Nuisance Ants	Excludes: Red imported fire ants, native fire ants, pharaoh ants, harvester ants and carpenter ants. What package sizes are available for Darlex? What is the Darlex application rate for darkling beetle control? 4 oz of Darlex per 1,000 sq. 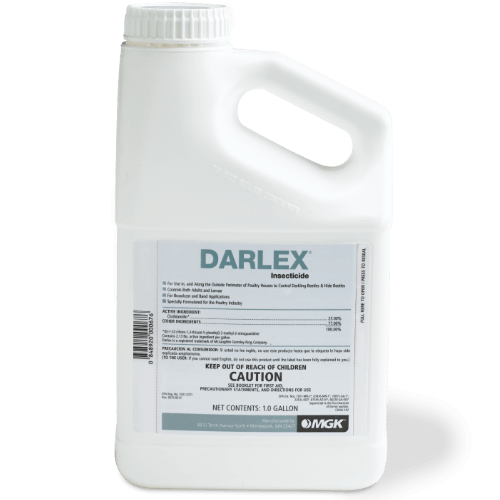 ft.
What product(s) can be used in rotation with Darlex for darkling beetle control?